The term ‘dementia’ describes a set of symptoms of physical disease that that include loss of memory, mood changes, and problems with communication and reasoning. There are many types of dementia, over a hundred distinct conditions are known, but our main concern will not be in what a condition is called but in how we can best help and provide care to individual persons affected. We do , however, need to have some understanding of what may be causing specific problems and how the individuals needs may change over time. 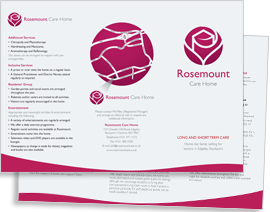 The most common terms you are likely to hear at Rosemount are Alzheimer’s disease and vascular dementia, but there are other conditions such as Picks Disease and Lewy Body Dementia that we may come across among residents. It is important to realise that dementia is not a normal effect of becoming older, as all the behavioural changes that result from dementia are caused by either disease or damage to the brain. It is also important to understand that the behavioural changes that happen when a person has one of the dementing conditions, are not caused by a mental illness but are caused by a physical illness that damages the brain. Although dementia is usually thought of as being a condition of old age, people of all ages can be affected. Becoming forgetful does not necessarily mean that a person has dementia. Memory loss can be a normal effect of ageing or it can also be a symptom of stress or depression. The early stages of dementia can be very hard to spot, especialy if the person concerned is aware of a problem and tries to hide that there is a change. A relatively common problem such as a urinary tract infection can sometimes cause symptoms that can be mistaken for dementia. In rare cases, dementia like symptoms can be caused by vitamin deficiencies or a brain tumour. Doctors use a diagnostic tool in the form of a series of standard set questions, which is used to assess the persons cognitive and reasoning abilities , that is designed to detect problems from the persons responses even when a person actively tries to hide that there is a problem. The Mini Mental State Examination(MMSE) is the most commonly used test for complaints of memory problems or when a diagnosis of dementia is being considered. If you are present when the test is being used you may think the doctor is asking things that have no bearing on how the person behaves, but each question has a diagnosic significance and helps towards making a medical diagnosis or the exclusion of dementia as a cause of a persons problems. Alzheimer’s disease, where small clumps of protein, known as plaques, begin to develop around brain cells. This disrupts the normal workings of the brain by preventing signals passing between brain cells. Vascular dementia, where problems with blood circulation result in parts of the brain not receiving enough blood and oxygen. Lewy Body Dementia where abnormal structures, known as Lewy bodies, develop inside the brain. Picks Disease , (frontotemporal dementia ) where the frontal and temporal lobes of the brain begin to shrink. Unlike other types of dementia, frontotemporal dementia usually develops in people who are under 65. It is much rarer than other types of dementia. Dementia often develops slowly and is not always obvious in the early stages. Symptoms similar to dementia can be seen in other illnesses. Sometimes it can be difficult to tell apart dementia from the usual mild forgetfulness seen in normal ageing. Regularly forgetting recent events, names and faces. Regularly misplacing items or putting them in odd places. Confusion about the time of day. Disorientation, especially away from your normal surroundings. Problems finding the right words. Reduced judgement, for example, being unaware of danger. Mood or behaviour problems such as apathy, irritability, or losing confidence. The ability to fix new memories becomes impaired as the disease advances, older memories become more real and stronger as the mind tries to interpret what is happening around the person . Often a person may interact with people speaking to them, but respond to a conversation they may have had many years in the past rather than what is being said to them, or they may place themselves in situations in the past and react as if they were involved in a former occupation. The loss of the ability to fix new memories means that eventually a person is unable to hold a thought in their head between starting to say a sentence and finishing it. A person will be unable to hold the image of what they see once they turn away. A person will eventually lose the ability to relate anything they see around them into anything meaningful, and the persons o concept of their own personality crumbles away. The behaviour of each person will be unique as no person will be damaged by the progression of the disease in exactly the same way as any other person. So, we have to deliver care according to the needs of each person no matter what the medical diagnosis may be. Vascular dementia symptoms are different as the damage to the brain is more sudden and in specific areas of the brain…changes can happen from one moment to the next as the incidents of bleeds and blockages in circulation to the brain take place. Lewy Body and Picks Disease symptoms tend be be similar to Alzheimers but the rate of progression is more rapid and the changes in personality and self neglect are more obvious before loss of memory is seen as a problem. Speech and the understanding of speech often declines, with the persons inability to hold conversation being an indicator of the condition. Inhibitions and values that a person may have held seem to be eroded away, and verbally aggressive behaviour is likely, with physical aggression appearing in a high proportion of cases. Really the diagnosis of the type of dementia involved is not our main concern, as it is the behaviour and means of managing that behaviour when we are dealing with a person who has a dementing illness, that we need to understand. At present there is no way to reverse and cure any of the forms of dementia. This is alarming as in this country it is estimated there are 800,000 people in the UKwith a form of dementia in 2012 . Among the age group 40 to 60 years old, 1 in a thousand will have the condition, 65 to 69 ,1 in a hundred will be affected, 70 to 79, 1 in 25 will be affected, rising to 1 in 6 among the 80 plus age group. For most suffers of dementia the only treatment has been the provision of nursing and personal care, that as well as providing for the physical needs of peaple affected, has also been used to slow down the the progression of dementias with the use of various therapy techniques. Such therapies in reality have had little or no long term proven benefits in preventing, curing or even slowing progression of dementias. There are no drug treatments available that can provide a cure for dementia. Some drugs have been developed that can improve symptoms, or temporarily slow down their progression for some but not all people. There are two main types of medication used to treat Alzheimer’s disease – cholinesterase inhibitors and NMDA receptor antagonists – which work in different ways. Cholinesterase inhibitors include donepezil hydrochloride (Aricept), rivastigmine and galantamine . The NMDA receptor antagonist is memantine . Research has shown that the brains of people with Alzheimer’s disease show a loss of nerve cells that use a chemical called acetylcholine as a chemical messenger. The loss of these nerve cells is related to the severity of symptoms that people experience. Donepezil, rivastigmine and galantamine prevent an enzyme known as acetylcholinesterase from breaking down acetylcholine in the brain. Increased concentrations of acetylcholine lead to increased communication between the nerve cells that use acetylcholine as a chemical messenger, which may in turn temporarily improve or stabilise the symptoms of Alzheimer’s disease. All three cholinesterase inhibitors work in a similar way, but one might suit an individual better than another, particularly in terms of side-effects experienced. Current NICE guidance for NHS treatment is that the cheapest of these drugs is generally tried first. The action of memantine is quite different from, and more complex than, that of donepezil, rivastigmine and galantamine. Memantine blocks a messenger chemical known as glutamate. Glutamate is released in excessive amounts when brain cells are damaged by Alzheimer’s disease and this causes the brain cells to be damaged further. Memantine can protect brain cells by blocking these effects of excess glutamate. The drugs do not work for everyone even if given at an early stage.Between 40 and 70 per cent of people with Alzheimer’s disease benefit from cholinesterase inhibitor treatment, but it is not effective for everyone and may improve symptoms only temporarily, between six and 12 months in most cases. According to an Alzheimer’s Society survey of 4,000 people, those using these treatments often experience improvements in motivation, anxiety levels and confidence, in addition to daily living, memory and thinking. Once a person is prescribed the drugs they will continue to be given them as research has shown that to stop giving the drugs results in a sharp decline in patients mental and physical abilities. Usually drugs for treating depression can have a positive effect as people with dementia also will suffer from seperate conditions that affect mood and emotions. These drugs can only be first prescribed by a consultant not a GP, and this causes long delays in a person first recieving treatment…..sometimes past the point where the drugs can be prescribed. The Alzheimers Society has ben campaigning for years to change this as they believe it is in effect a form of rationing the drugs to reduce costs. The current cost of these drugs to the NHS ranges from £800 to £1,000 per patient each year. However, the UK patents for all these drugs are expiring during 2012 and prices will start to fall dramatically as competing ‘generic’ versions are introduced. Whether these drugs are obtained on the NHS or privately, the patient must be willing to take the treatment, and should discuss any possible benefits, risks or side-effects with the doctor. There are no specific drugs for the other types of dementia although Aricept and the other drugs are being researched as to the effect they have on Picks Disease and Lewy Body Dementia. There have been some research projects concerning the use of stem cell implants following some success with other conditions such as Parkinson’s Disease, but there is nothing conclusive yet. The outlok for people with dementing illnesses may seem depressing but research continues. Part two will look at the care provision to meet the needs of people who have dementia, and the role that we as Carers have in providing dignity and a decent quality of life.